If you want to avoid frequent mistakes when you learn German vocabulary you HAVE to have a look at these tricks and learning aids! If you want to learn German or another foreign language; in the beginning, learning vocabulary is the most important thing to do. 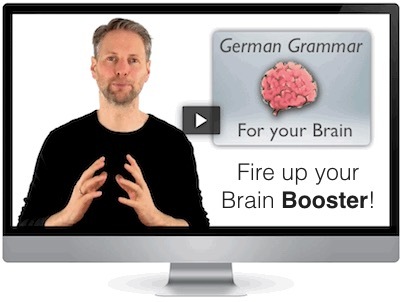 Because with this you build your own personal so-called “mental lexicon”, which you’ll definitely need if you’re serious about learning German. HOW do you learn German vocabulary? I have many years of experience as a teacher of German, and trust me, I know what I’m talking about. Most students of German don’t really think about THE WAY they should learn and therefore waste valuable potential. In reality, soon enough they don’t remember where they’ve actually written them down. Why? Because from the start they didn’t feel like writing down these spontaneous notes once again in a systematic way. A fatal mistake! The consequences? you don’t understand native German speakers; you do remember having written down this or that word somewhere, but what was it again? How does one say that in German? What I just described, is a vicious circle! Other students are more disciplined; and decide for themselves to always keep things nicely in order, and immediately write down all the important words in a VOCABULARY-NOTEBOOK. They always carry it with them and thus even “learn” vocabulary on a regular base. Then suddenly they need a certain word, but nonetheless can’t remember it. WHY is this? you think you learned a word, while in reality you only knew its place in your list of words. you’re not able to systematize the vocab. Besides, it is very important that you have an overview of the words that you already know and the words you still need to practice. You must definitely work with flash cards! I know, many people don’t feel like writing their cards in a regular way, but hey! After all you want to learn German, and as quickly as possible. The learning of vocabulary is for this purpose an indispensable cornerstone. So, please make the effort and write down every word that you learn on a flash card. On the back, write down the translation in your mother tongue. The only problem with cards is often that it takes a lot of work to write them and then afterwards, when you want to study them once more, some of the cards are lost. The solution: Write your cards on the computer and you’ll find them every time again! With these free templates for Word and Open Office, you can write up to 100 cards per file on the computer! The given frame has exactly the same size as an A8-card. this way your valuable writing time is never wasted! When learning nouns, you must definitely make sure that you ALWAYS include the article and the plural, when you write them down. You can find this information in a dictionary for German as a foreign language. In such a dictionary, the article always precedes the noun. After the noun you will find the ending of the genitive case and after that, the ending of the plural. In German there are 6 different possibilities to form the plural, therefore you always have to learn the plural together with the noun. Especially nouns you can learn in a much easier way, if you label objects in your environment with their German names: So, label each object. Basically, you can learn in a better way, if you use as many senses as possible. With this method of labeling, you link each word with a spatial correlation and therefore you’re able to remember it better. The power of our spatial memory is very strong and it was discovered by a certain Simonides in ancient Greece. We owe the discovery and the development of mnemonics in the first place to him. Luckily, German adjectives are easier to learn than nouns and verbs, but here as well: there are regular (weak) and irregular (strong) adjectives. It all boils down to the form in which they are used. Therefore, with regards to the strong adjectives, you always need to learn the Comparative and the Superlative together with the adjective. And as always, you can find all the important information in the dictionary for German as a foreign language. Learning German vocabulary with cards is really the best method I know, and I highly recommend it. But you certainly know the feeling that it is nevertheless very difficult to memorize all this new information. Therefore I will give you a few of my personal tricks, with which you’re guaranteed to learn more easily. You can combine all these aids with your card-system and in doing so you’ll be able to learn German in a really unbeatable, fast and organized way. The American cognitive psychologist Richard Atkinson tested a mnemotechnique, as early as the 70ties, with which ALL THE EXPERIMENTAL SUBJECTS were able to learn vocabulary more easily; namely the so-called “keyword-method”. The method works in such way that you use your own mother tongue to learn the vocabulary of any language. In my e-book “Learn German grammar with mnemonics”, I explain precisely and step by step how this super-technique as well as many other learning techniques for German grammar work. If you’re looking for super-learning techniques in order to learn vocabulary, difficult verbs, the declension of adjectives and much more, then this e-book is exactly what you need. Click here, if you want to learn to know the super-learning techniques for German grammar!